Even though I retired at age sixty-two to become a full-time writer–I wasn’t yet a published author–I soon learned that I couldn’t spend eight hours a day five days a week writing. Not every week, anyhow. The important thing was I had ENOUGH time to write consistently. Although I realized that writing would continue to serve as my main activity, I gradually learned that I had time for other activities as well. One of the most important is the nursing home ministry my church is involved with on Wednesday mornings. I joined the team that handles the services there all but the second Wednesday of each month. I became the second guitar player on the team, which has been fun, and I’ve become an even better by-ear player than before, since I don’t have access to the words and chords. I do a solo every week–one of my own songs–but I don’t participate in the singing otherwise. Not that I wouldn’t be free to, but I couldn’t take an hour of standing, Plus I still don’t know some of the songs–make that MANY of them–the team uses, and the majority of them are in a key that’s wrong for my voice. But doing what I can do is very fulfilling. I’ve even learned to become more comfortable with old folks who are much more decrepit than I hope I’ll ever be. Another musical project is playing bass guitar for the Christmas musical. Although I’ve been playing bass almost as long as I’ve been playing guitar, I’m not into the fancy stuff. In order to make my playing as effective as possible, I usually spend about an hour a day practicing with a professional CD of the musical–from September until Christmas. My wife and I walk for exercise four evenings a week. Although I was already walking by myself on Friday mornings, I’ve recently begun doing an extra half-hour walk three to four days a week. Although outdoors in the neighborhood is preferable, I like going to the mall sometimes even when the weather is good because–being at home by myself so much with just the dog and cat–it gives me a change of scenery. I admit it! One of my favorite almost-daily activities is an afternoon snooze. 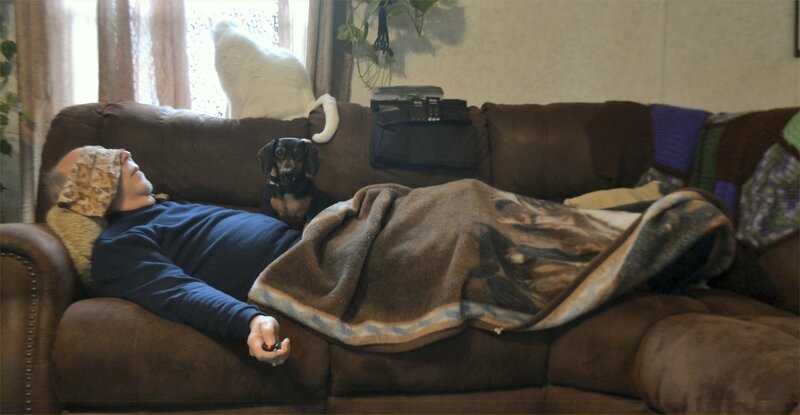 Soon after my wife returns to work after lunch, I sack out on the sofa with the miniature dachshund curled up beside me under the afghan. Thirty minutes is amazingly refreshing. The only problem is making myself get started again after I wake up. I try to limit Solitaire and Words with Friends to evenings and break times. And then there’s helping with the regular grocery shopping (and picking up occasional items we’ve run out of), doing the laundry, mowing the lawn, and doing the vacuuming. Only occasionally am I asked to fix something; Kathleen knows my weaknesses. However, I occasionally put together something (new kitchen stools are the most recent project) that comes unassembled. Sometimes I even shock Kathleen by following the directions and not having any parts left over. Of course, I also am taking more pictures, spending more time working on my blogs and website, and reading. Not only am I on track with a read-the-Bible-through Kindle app, I’m currently reading two biblical non-fiction books; which one I read when depends on what room I’m in at the time. I’m usually reading fiction, though. My health seems to be good. Even so, the past seven years have seen me have cataract surgery on both eyes (several years apart) and a minor “procedure” that has failed to eliminate the mystery pain that has been and is continuing to bother me. I was diagnosed with diabetes three or four years ago, but my doctor hit the nail on the head when he told me to lose weight instead of counting carbs. I lost fifty pounds, take a prescription called Metformin, and do a blood sugar test on myself once a week. The reading hasn’t been as high as 100 in years, and I’m thankful God has taken care of that problem. I’m not quite as agile as I used to be at my guitar playing, but that hasn’t yet proven a major problem. However, I did quit making wooden crosses and walking sticks because of how those activities hurt my hands. And I’m none too sure I’ll be up to any more mission trips. As you can see, these health issues–no matter how minor–affect what I feel like doing and–to a lesser extent–what I’m able to do. Sixty-nine isn’t that old, but the end is coming–sooner or later. When, God alone knows. But I enjoy my retirement just as I enjoy and appreciate life itself, and I’m thankful to have such fulfilling activities to keep me busy. What about you? Whether you’re retired or not, do you find life fulfilling? How about leaving a comment?